The thyroid is a tiny, butterfly-shaped organ with great effects. It is the driver and clock of our body and produces hormones that regulate the metabolism and energy balance. If the thyroid itself is out of sync, it can affect all processes in the body. Sometimes the gland tissue develops thyroid nodules. Why do some of us develop thyroid nodules? Thyroid nodules may develop, for example, in the case of iodine deficiency. If the thyroid gets too little iodine, it grows and enlarges its tissue, to get "enough". As a result, the thyroid cells and tissue nodules multiply. Thyroid nodules are almost always benign, with only about five percent of nodules being malignant. How common are benign thyroid nodules? With a benign thyroid nodule you are not alone: ​​In about 30 percent of adults, these nodular tissue changes occur, in people over 65 years, the proportion even rises to more than 50 percent. In addition to older patients, women are particularly often affected. They develop a node four times more often than men. How are thyroid nodules discovered? They are often discovered during routine examinations or sometimes even palpated by the patient. Thyroid nodules often grow very slowly, and many usually do not notice the tissue changes at all. However, when a nodule is large, you may experience problems with swallowing, hoarseness, neck pain, or uncomfortable pressure in the neck area. In addition, larger nodes can also visually disturb. In any case, talk to your doctor if you discover a nodule or have discomfort. What are “hot” and “cold” nodules? Hot and cold nodules have nothing to do with temperature. Rather, it’s about how active the nodules are – and whether they produce hormones or not. Normally active nodes always produce the desired amount of hormones, whereas cold nodules produce few or no hormones at all. In a hot nodule, however, the cells are working in the chord, so to speak. They produce hormones uncontrollably, take up a lot of iodine and can thus lead to an over-functioning of the thyroid. Hot nodules are the rarest and are of benign nature. Which doctor do I go to? In a first step, consult a thyroid specialist, nuclear medicine or endocrinologist. During the examination, the doctor first scans the neck and then performs an ultrasound examination. In addition, a blood sample is taken to check thyroid levels. If the doctor detects a nodule, a scintigram is usually taken. With the help of this imaging technique, the physician can check after administration of radioactive technetium whether it is a so-called cold, normally active or hot node. Further tools of the diagnosis are the fine needle biopsy, i.e. the removal of a tissue sample, as well as the MIBI scintigraphy. These show if the node can possibly be malicious. Many people think: A nodule means cancer. But only about five percent of the nodules are malignant and therefore cancerous. A diagnosis by your doctor will clarify this before treatment. Hot thyroid nodules are even always benign – however, they can lead to hyperthyroidism, which changes your metabolism and has a negative effect on the whole body. So far, benign thyroid nodules are usually treated with radioactive or surgical procedures. Echotherapy may be an alternative to surgery. It is also useful when the lump is growing, when you have discomfort or when radioiodine therapy is not appropriate. Echotherapy can also be useful if you want to prevent further node growth. Talk about it directly with your doctor. They basically heat and shrink the nodules – without surgery, cuts and scars. The result: The destroyed tissue melts and the body decomposes it independently over time. The surrounding healthy thyroid tissue is spared optimally and retains its normal function. This is important because patients who have had their entire thyroid gland removed, or most of it, usually need to take hormones throughout their lives. An echotherapy session lasts only about 20 to 60 minutes, which can usually be done without general anesthesia. Treatment with echotherapy may be inpatient or outpatient. During the treatment, you lie comfortably on the back, the neck is stretched. 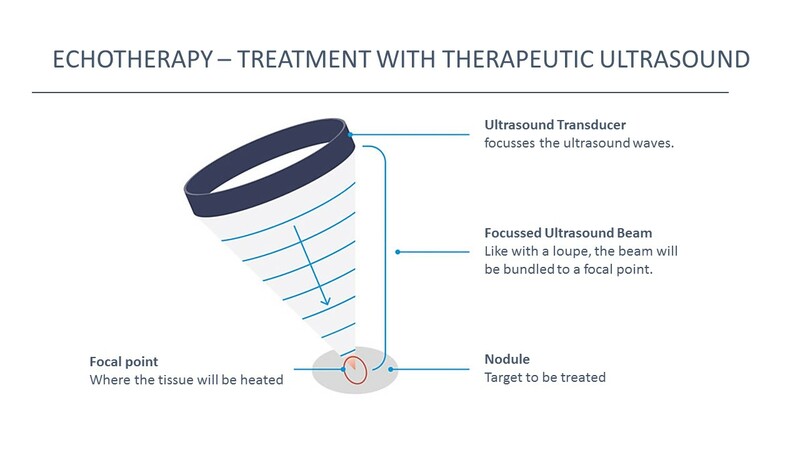 During the entire treatment the therapeutic ultrasound beam is combined with an ultrasound image of lower entergy to controll and guide the therapeutic action. After treatment with echotherapy, you can usually immediately resume your daily routine. Are there any clinical studies on echotherapy? Yes, clinical studies confirm the efficacy of echotherapy in benign thyroid nodules. For example, a study conducted at the University of Hong Kong showed that the volume of benign thyroid nodules was reduced by 68.3% on average six months after treatment with echotherapy¹. The nodule continues to shrink after this period. An up-to-date overview of published scientific publications on echotherapy for thyroid nodules, can be found here. You want to learn more about echotherapy? Let us help you. Please simply fill out the contact form and we will get in touch with you by email or by phone.